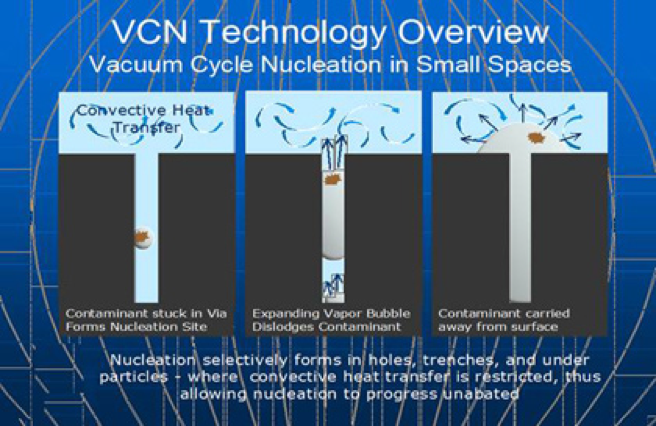 Vacuum Cycle Nucleation (VCN) is the most exciting advancement in industrial cleaning since the introduction of ultrasonics. VCN provides superior performance in both aqueous and solvent applications. Nucleation selectively forms in the holes, trenches, and under particles where convective heat transfer is restricted, thus allowing nucleation to progress unabated. When challenged to clean the internals of a part, until now we had to try cleaning methods used for external part’s cleaning. Ultrasonics works well on external surfaces and can often penetrate into areas that can be seen from the outside of the part, but ultrasonics cannot pass through solid surfaces and therefore has little effect on internal surfaces. Vapor degreasing can reach some of the internal surfaces of a part but since there is no mechanism for removing the cleaning liquid other than drying, solvents simply dissolve the contaminant and then the contaminant is redeposited to the surface during drying. Power spraying can penetrate only a short distance into a part and loses it’s effectiveness very quickly in tight areas. Although fluids can be forced through a part’s internal volume, often tedious methods such as manifolding is required and even then channeling can render the method suspect at best. All these methods attempt to clean an internal surface using an external force. It is better to start the cleaning process at the target area by pushing fluid out of the part as opposed to trying to penetrate the part from the outside. It is better to clean from the inside out when cleaning internal surfaces. This is the basic principal behind the VCN process. The result is a fast, complete cleaning that reaches all surfaces within your part. The process is accomplished by applying a vacuum to an enclosed chamber containing a part submerged in a liquid. Reducing the pressure to below the vapor pressure of the liquid results in the formation of vapor bubbles at the solid part’s surface where typically nucleation sites for bubble formation can be found in the form of imperfections, crevices, pores, channels or foreign particle material. The growing vapor forces liquid from the part creating fluid agitation throughout the part. The cleaning liquid being forced from the part’s internal volume carries contaminant and particles to the bulk fluid. The vacuum is paused to allow fresh cleaning fluid to enter the part and the cycle is repeated until the part is cleaned. A typical cycle time is from 1 to 3 seconds so that a very short time is needed to completely clean a part.